In 1985 Joe Traeger started up Traeger Grills and introduced the first pellet grill to the world. 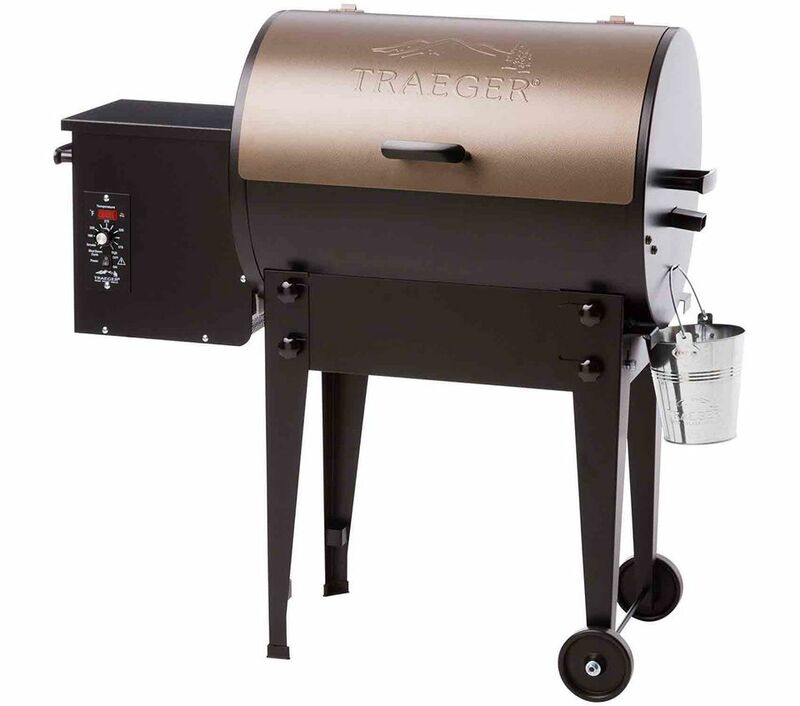 Since then the Traeger family has continued to make pellet grills and smokers that have developed a larger than cult following, leading to a wide range of pellet grills and smokers on the market. The flavor and the versatility have made them a favorite among serious backyard cooks. A good pellet grill will grill, roast, and smoke. A wood pellet is a small, 1/4 inch diameter piece of hardwood and looks like a long pill. Because of their small size, wood pellets burn cleanly and quickly to a fine ash. Wood pellets burn at about 8,500 BTUs per pound per hour. Wood pellets come in a wide variety of "flavors" ranging from hickory and oak to cherry, apple or mesquite. The pellets in a normal pellet grill are fed from a storage hopper to a burning box at a controlled rate. This rate is adjustable based on whether you want a high temperature for grilling or a low temperature for smoking. Because of the automated feed of the wood pellets, you can literally turn the unit on, give it 10 to 15 minutes to heat up, and be ready to grill in almost no time. This makes it as convenient as a gas grill but with the added flavor of hardwood cooking. Most manufacturers of pellet grills offer a temperature control unit (with varying levels of sophistication) that will allow you to set the temperature to within 5 degrees of your ideal temperature. This automation is also great when it comes to smoking. You can smoke for hours in a temperature controlled environment with little work from you. One consideration on pellet grills is the cost and availability of fuel. A pellet grill runs only on pellets, so you should know of a good source for them. Wood pellets sell anywhere from $1USD to $2USD a pound, though you can get them cheaper if you buy bulk. On high, a pellet grill will consume about 2 pounds of pellets per hour. This would be the temperature you grill steaks and burgers at. Depending on the outside temperature, wind, and the temperature the grill is set at, pellet consumption can vary a great deal. Just understand that pellet grills consume the most expensive fuel that a grill can run on. Another factor to consider is that pellet grills are mechanically complicated. Depending on the model they will have an auger to feed the pellets, a fan to accelerate the combustion, a heating element to initiate fire and all these will be controlled by a small computer. Pellet grills these days can be Wi-Fi or Bluetooth enabled to allow for remote monitoring and control. They may have meat probes to monitor cooking times. Pellet grills can be capable of a wide range of functions depending on what you spend. All this complexity requires a good deal of maintenance. Ash will build up inside the grill and fire pot and this needs to be cleaned out. Some manufacturers recommend a complete inspection and clean after every 8 hours of operation. So, while they are frequently billed with a "set it and forget it" functionality, there will be a lot more to maintaining them than that. If you are serious about real wood fire flavor in an easy to use unit then you really should consider a pellet grill. Pellet grills can cost anywhere from around $500USD for a small one to up to $9,000USD for a big and fancy one. Check out my Pellet Grill Reviews to find the pellet grill that is right for you.